I have been folding origami as a hobby for over 12 years, and working with metal jewelry for 7 years. It was in 2008 when I first combined the two and started creating the metal origami jewelry. Since then, my art has been in craft fairs, art shows, and museums worldwide. I'm a self taught jewelry designer, but I learned all the basics of working with metals during my years as a musician. I trained in musical instrument repair, and discovered that many of the tools and techniques transferred easily to the new medium. 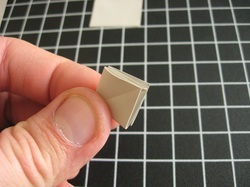 Origami folded from metal, or orikane, has been around for many years. As these origami items are made from pure silver, they may tarnish with age. I coat everything with a thin layer of wax for protection, but this does eventually wear off. You can keep your origami item looking great with silver polish and a soft cloth.